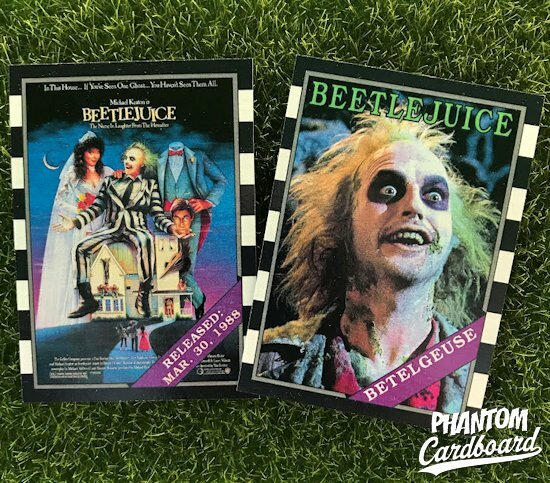 Who doesn’t love Beetlejuice? I love Beetlejuice. My mom loved Beetlejuice. My kids love Beetlejuice. Everyone should love Beetlejuice. He’s the ghost with the most! Shame on anyone who doesn’t watch it at least once a year around Halloween time. 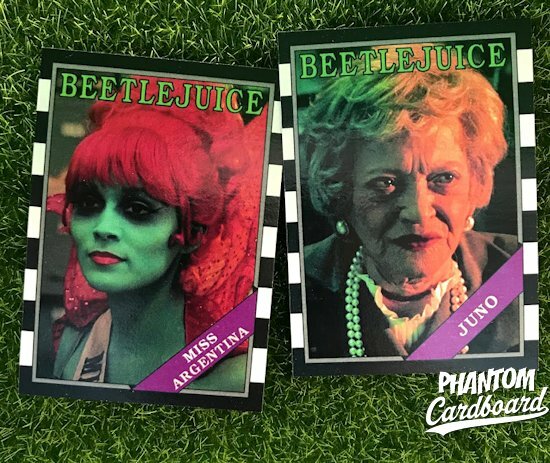 It’s kind of hard to believe this movie didn’t already have a licensed trading card set. Well, there was one for the cartoon series, just nothing for the movie. This mini-set is the first of at least three 1988 Topps baseball inspired designs I’ll be releasing in celebration of some really cool movies that were released that year and thus are turning thirty in 2018. For me, 1988 was probably my most seminal year of the decade. I just remember really developing a passion for a few things that would turn into lifelong loves for me. For one, baseball / trading cards. I’ve mentioned in past posts that the 1987 Topps baseball cards were the first sports wax packs I ever opened, but my collecting hit a fever pitch the next year. Topps, Donruss, Score, Fleer … it didn’t matter. I was hooked. At the same time I fell in love with basketball and the Detroit (Bad Boy) Pistons. They were one heart breaking blown call from beating the Lakers in the 6th game of the 1988 NBA Finals. Then there was the music, TV, video games and movies. Any of which takes me back in time 30 years when everything instantly felt like the greatest ever, and much of it has remained that way for me to this day. 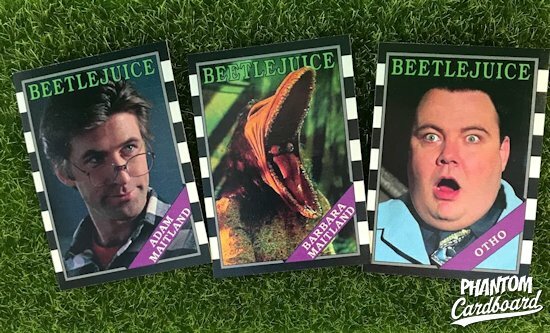 I can remember badly wanting to see Beetlejuice at the movies. We went but it wasn’t showing or something. We ended up seeing Johnny Be Good. That wasn’t meant as a punchline, but it kind of feels like one after typing it out. This, like a lot of cards I was making at first, started off as a one-off. The Jeffrey Jones “Charles Deetz” card, knowing I had a good shot at having it signed through the mail. I knew how I wanted the card to look and executed my exact vision. The template is the ‘88 Topps, but it is an unmistakably Burton-esque inspired trading card. There was no experimenting with different colors schemes. The colors you see were my only choice for both the title and name sash. The alternating black and white horizontal striped background is to me the designs greatest asset as it is a recognizable optic throughout the movie and later in the cartoon series and toy line. Now that I’ve decided to expand some of my singles into mini-sets to give a new energy to my little hobby I get to plug in lead characters to the templates. 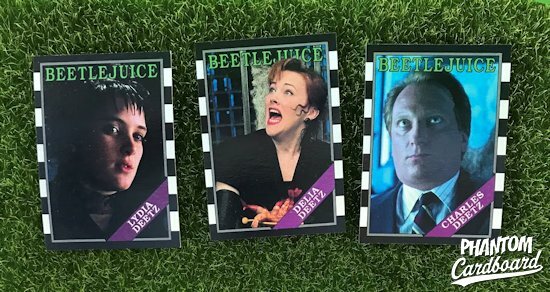 I may never get to have my “Betelguese” card signed by all-time favorite actor, but you can’t very well have a Beetlejuice set without Michael Keaton, can you? I think my favorite card in the set is the “Miss Argentina” card. She was a memorable as a small part character, plus the colors of her makeup and wig really pop. I’ve added a title card to this and a few of my other sets as a way to pay homage to some of the classic illustrated movie posters of the past. I think it makes for a nice addition.